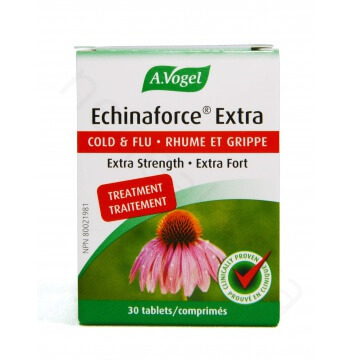 A.Vogel Echinaforce® Extra is made from fresh organically grown Echinacea herb and root. Studies show that its polysaccharides and polyacetylenes components are capable of stimulating the phagocytosis of macrophages and the production of cytokines like interleukine-1, interleukine-6 (also called interferon beta), interleukine-10 and TNF alpha factor. 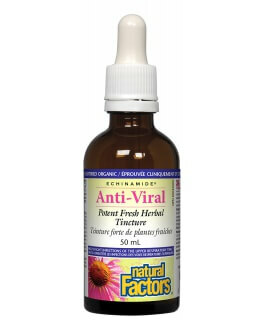 Thus, proving its ability to strengthen our immune system during cases of infections. Clinically shown to help prevent and relieve the symptoms of upper respiratory tract infections (URTI), such as the common cold and the flu. It also shortens the duration of URTI. Used in Herbal Medicine to support the immune system, especially in times of stress, lack of sleep and for smokers. Made with 1200mg of fresh echinacea tincture per tablet. 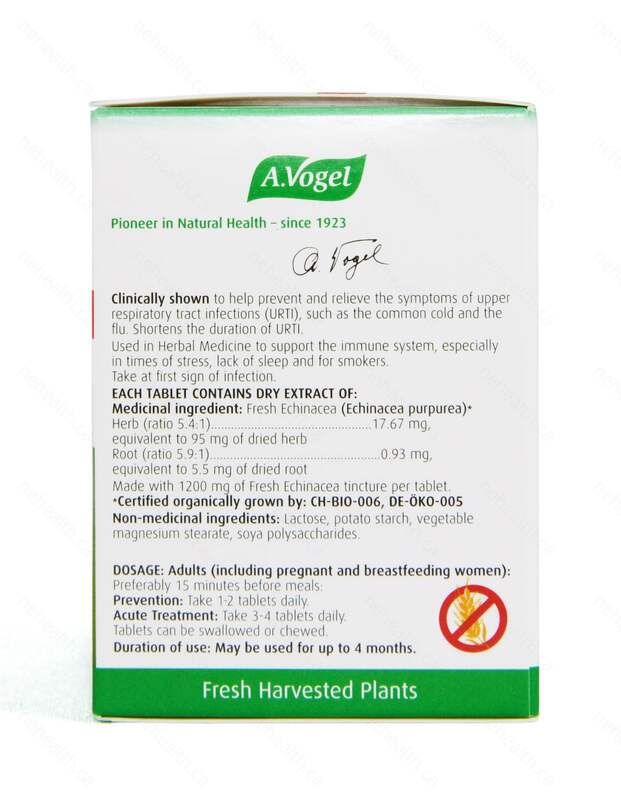 Non-Medicinal Ingredients: Lactose , starch , vegetable magnesium stearate , soya polysaccharides. Acute Treatment: Take 3-4 tablets daily. Tablets can be swallowed or chewed. 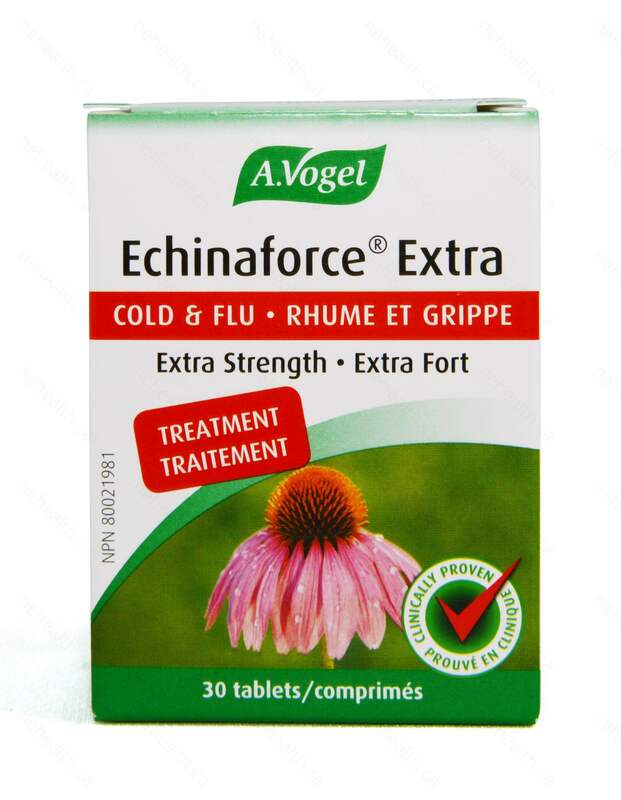 Echinaforce® Extra are clinically proven safe to be taken by pregnant and nursing women. Caution: Consult a healthcare practitioner prior to use if you are taking immunosuppressants, or if you have an autoimmune disorder or a progressive systemic disease such as: tuberculosis, collagenosis, AIDS and/or HIV infections or multiple sclerosis, . Discontinue immediately in case of hypersensitivity/allergic reaction. 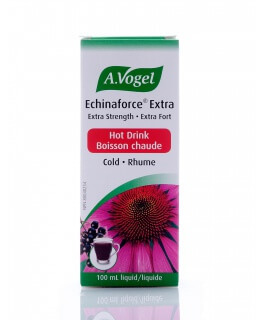 Do not use if you have an allergy to Asteraceae/Compositae (daisy) family and elderberries or in case of known allergy to any of the ingredients in the product. Consult a healthcare practitioner if symptoms persist or worsen.